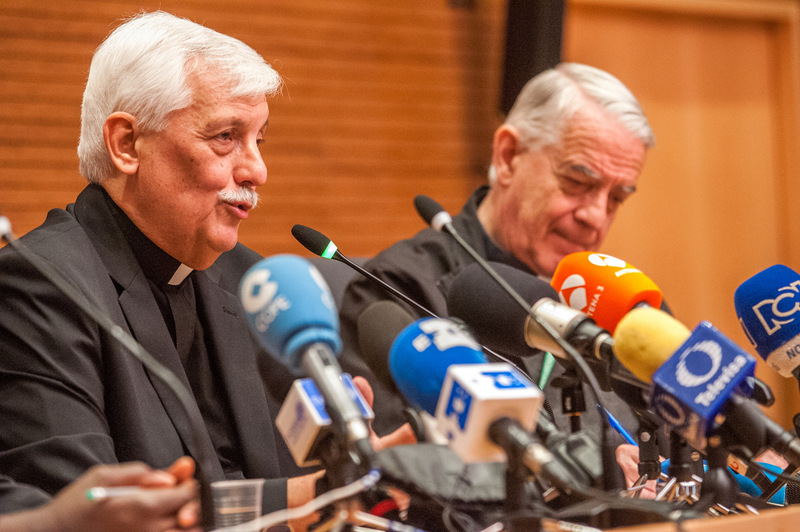 Just a few days after his election, Father General Arturo Sosa met with some 70 journalists in the aula of the General Congregation, his baptism to this kind of event as Superior General of the Society of Jesus. He was introduced by Fr. Federico Lombardi who mentioned that the new General had been part of the 33rd General Congregation in 1983 as the youngest delegate. Fr. Lombardi emphasized the good relationship between Fr. Sosa and the previous General, Fr. Adolfo Nicolás. He noted that Fr. Sosa was the first non-European General of the Jesuits. In his initial remarks, the new Superior General stated that he was at peace, that although he certainly did not expect to be elected, he was confident in God and ready to serve the Society of Jesus and the Church in this new role. He also mentioned how grateful he was, on behalf of the whole Society, to his predecessor, Fr. Adolfo Nicolás, who had given himself entirely to his service; he mentioned that the previous Superior General will be returning serve according to the instructions of his superiors, as any Jesuit does whatever his responsibilities has been within the Order. Finally, he stated that this General Congregation was not expected to change the direction the Jesuits have been involved in for decades now, that is, the service of the faith and the promotion of justice. Rather, there is a need to find the best and most efficient ways to serve today in a diversified and multicultural world and in a context that is asking for multiple types of collaboration. There were some 40 minutes available for questions from the journalists. There were a dozen questions asked from media members from a number of countries among them Spain, Chile, Argentina, France, the USA and Italy. The first question was not unexpected: what would the new General say about the situation of his country, Venezuela? Fr. Sosa acknowledged that he had spent a large part of his academic life studying and commenting on the political life of Venezuela. He explained briefly how a country that was living only on the income from one natural resource, within a system entirely managed by the government, could not easily live a true democracy. On the other hand, he insisted on the fact that a large part of the population is hoping for new bridges between all so that a real dialogue could start in view of building something that would profit all. Two or three questions were related to Pope Francis, his expected relationship with him and more broadly the relationship of the Jesuits with the pope whom they vow to serve. The General was also asked if he liked to be considered “the Black Pope”. To this last question, he answered that he was not fond of this designation. He explained that since the beginning the Jesuits have wanted to respond to the popes’ requests to serve where there was need, because they believe in the universal vision the pope has as universal pastor. He also mentioned that he had several opportunities to meet the present Pope, first during the 33rd General Congregation, then within the context of his work with the social centres in Latin America, in Argentina, and more recently in his duties as Delegate of the Father General for the Interprovincial Roman Houses and Works. Their encounters have always been cordial and fruitful. Father General was also asked about the way he was elected, the reasons for the resignation of his predecessor and the fact that he was elected for life, about his priorities, about the main challenges the Jesuits are now facing. To each one of these questions he shed light on the meaning of his function and moreover on the commitment of the Jesuits to contribute, humbly, and through their attachment to Jesus, to the building of a world that would give the priority to each human person.